"This recipe can be done in the slow cooker or the oven (at 325 degrees F). 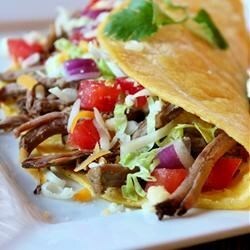 It is pulled beef taco meat. The leftovers makes superb enchiladas. Spicy and full-bodied flavor without overdone heat." Lay the chuck roast into the bottom of a slow cooker with a tight-fitting lid. Sprinkle the taco seasoning mix over the beef. Pour the green salsa over the beef, followed by the beef broth. Cook on Low for 4 hours. Add more beef broth if needed. Remove the beef from the slow cooker and shred with two forks. Return the shredded beef to the slow cooker; mix with the liquid. Serve hot. Such an easy recipe. Just throw it all in the slow cooker. I cooked it for about 6-8 hours it wasn't really shreddable at 4 hours. Also, I would imagine you can use any salsa.